EW-7728In complies with 802.11n draft 2.0, the next generation wireless standard. With the advanced MIMO technology, it can support the data transmission rate 6 times more (up to 300Mbps) and the coverage 3 times more than IEEE 802.11b/g devices. 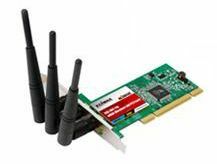 EW-7728In supports the WPS configuration function, which provides easy procedures to set up wireless security. /files/data/pdf/EW-7728IN_manual.pdf|Click here to view product manual. /files/data/pdf/EW-7728IN_data.pdf|Click here to view product data sheet.